Lee & Low Books, 9781600606595, 28pp. Basant is here, with feasts and parties to celebrate the arrival of spring. But what Malik is looking forward to most is doing battle from his rooftop with Falcon, the special kite he has built for speed. 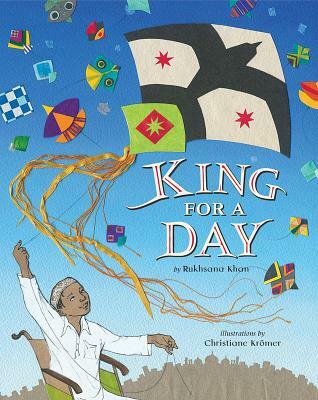 Today is Malik's chance to be the best kite fighter, the king of Basant. In two fierce battles, Malik takes down the kites flown by the bully next door. Then Malik moves on, guiding Falcon into leaps, swirls, and dives, slashing strings and plucking kites from the sky. By the end of the day, Malik has a big pile of captured kites. He is the king But then the bully reappears, trying to take a kite from a girl in the alley below. With a sudden act of kingly generosity, Malik finds the perfect way to help the girl. This lively, contemporary story introduces readers to a centuries-old festival and the traditional sport of kite fighting, and to a spirited, determined young boy who masters the sport while finding his own way to face and overcome life's challenges.